Not to be confused with National Clandestine Service. 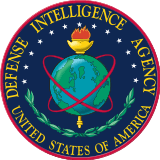 Contrary to some public and media misunderstanding, DCS is not a "new" intelligence agency but rather a consolidation, expansion and realignment of existing Defense HUMINT activities, which have been carried out by DIA for decades under various names, most recently as the Defense Human Intelligence Service. In 2012, the Pentagon announced its intention to ramp up spying operations against high-priority targets, such as Iran and China, under an intelligence reorganization aimed at expanding the military’s espionage efforts beyond war zones. To this end, the DIA consolidated its existing human intelligence capabilities into the Defense Clandestine Service, with plans to work closely with the CIA and the Joint Special Operations Command. 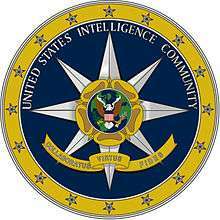 DCS absorbed the former Defense HUMINT Service, the former Defense Human Intelligence and Counterterrorism Center, the Counterintelligence Field Activity, and the Strategic Support Branch to create an integrated Department of Defense (DOD) espionage service. DCS' more clearly delineated career paths would give DIA case officers better opportunities to continue their espionage assignments abroad. The plan was developed in response to a classified study completed in 2011 by the Director of National Intelligence, which concluded that the military’s espionage efforts needed to be more focused on major targets beyond the tactical considerations of Iraq and Afghanistan. While in the past, DIA was effectively conducting its traditional, and much larger, mission of providing intelligence to troops and commanders in war zones, the study noted it needed to focus more attention outside the battlefields on "national intelligence"—gathering and distributing information on global issues and sharing that intelligence with other agencies. The realignment was expected to affect several hundred operatives who already worked in intelligence assignments abroad, mostly as case officers for the DIA, which serves as the Pentagon's main source of human intelligence and analysis. The new service was expected to grow by several hundred operatives and was intended to complement the espionage network of the CIA, which focuses on a wider array of non-military threats. The original Defense Clandestine Service, an outgrowth of the Monarch Eagle concept, was created and implemented in 1984. It was backed by Senators Barry Goldwater and Jesse Helms, with the support of Chairman of the Joint Chiefs General John Vessey, Assistant Secretary of the Army for Manpower & Reserve Affairs (M&RA) William D. Clark, and Deputy Assistant Secretary of Defense for Intelligence Frank Aurilio. It consolidated the clandestine intelligence programs of each of the military services into a single DOD program, thus eliminating duplication of effort, and importantly, to provide a promotion path for case officers to achieve flag rank. The Goldwater–Nichols Act was specifically designed to support this objective as service at the DOD level would count toward the joint service requirement to achieve flag rank. The objective of the DOD Clandestine Service was to target intelligence gaps in countries regarded as potential adversaries or sites of activities requiring a military response; these gaps had gone unaddressed under CIA priorities. DOD case officers are carefully selected and trained; most have advanced degrees, speak multiple languages, and are area experts. The Senate Select Committee on Intelligence praised the program for its exceptional productivity. By the mid-1990s, the program had been undercut by President Clinton's directors of Central Intelligence, who preferred to be in full control of all espionage operations. The seal of the Defense Clandestine Service consists of a Black disc rimmed Red, an American bald eagle Proper, wings displayed and inverted, perched upon a shield blazoned: Argent, six pallets Gules; a chief Azure, thirteen mullets of the first. Below the shield is a laurel and olive wreath Proper. 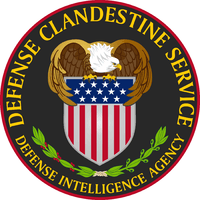 In an arch above the eagle is the inscription "DEFENSE CLANDESTINE SERVICE" and in an arch below the wreath the inscription "DEFENSE INTELLIGENCE AGENCY" all in Yellow letters. The eagle and shield are prominent symbols of the Department of Defense. The perch and sharp eye of the eagle denote the Defense Clandestine Service’s ability to plan, coordinate and execute worldwide missions. Here the eagle looks to his left side, illustrating the Service’s competence to meet national level defense intelligence requirements. The wings slightly cloak the shield, alluding to clandestine and overt operations. The laurel and olive wreath honors the teamwork among Defense Intelligence Agency clandestine service members, in concert with the Central Intelligence Agency, the Federal Bureau of Investigation and Combatant Commands. The black disc underscores the worldwide clandestine operations of the Service. 1 2 Naylor, Sean (31 July 2015). "Top Pentagon Intel Officer: Iraq 'May Not Come Back as an Intact State'". Foreign Policy. ↑ Pellerin, Cheryl (15 August 2012). "Flynn: Integrated Intelligence System Provides Advantage". United States Department of Defense. ↑ Miller, Greg (23 April 2012). "Pentagon establishes Defense Clandestine Service, new espionage unit". The Washington Post. ↑ Entous, Adam (23 April 2012). "Pentagon Creates New Spy Service in Revamp". Wall Street Journal. ↑ Schmitt, Eric (23 April 2012). "Defense Department Plans New Intelligence Gathering Service". The New York Times. ↑ Miller, Greg (2 December 2012). "DIA to send hundreds more spies overseas". The Washington Post.